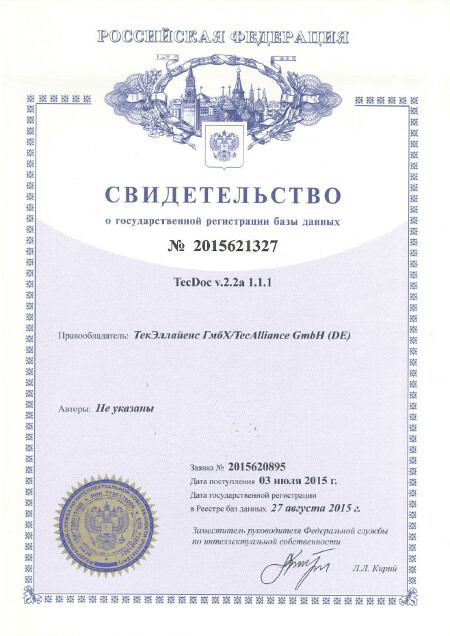 The TecDoc database has been registered with the Russian patent office Rospatent under the number 2015621327 since August 2015. As information protected by copyright and ancillary laws, the TecDoc database and structure may not be copied or used without the relevant licence. This registration makes it easier to validate claims for restraint, information and damages in the event of infringements. As of November 2015, TecAlliance in Russia will now be taking more stringent measures to combat the illegal use of the TecDoc database. Unlawful use can be unequivocally proven using special features within the database. TecAlliance will be supported on site by a renowned law firm specialised in copyright law. If you have any questions concerning TecDoc Data registration at Rospatent or TecAlliance activities in Russia, pleases feel free to contact Robert Szwed, Director Sales Eastern Europe (robert.szwed@tecalliance.net).